Belle de Couture: Orange Blouse + Bell Bottoms. Orange Blouse + Bell Bottoms. P.S. I recently decided to give the orange lipstick a whirl. The lipstick I'm wearing in this post is Revlon moon drops lipstick in #710 "Orange Flip." What do you think? Are you an orange lipstick fan? I like it on most people, just not sure how much I like it on me. Nothing beats a bright pink or red lip, in my opinion...But, who knows...maybe it will grow on me. Don't forget to check out my latest giveaway HERE! You pull off orange very nicely, which not everyone can do. I love the simplicity of this outfit. Gorgeous! This outfit is great and very 70's! I'm majorly crushing on this orange blouse! It is perfect! I think this lip color looks amazing on you! It looks great with your skin tone. JEN I LOVE THIS! Wow... you are seriously amazing in this look. The orange mixed with leopard (my fav) is genius! Seriously. Model status! Chic! You look absolutely amazing! Do you know what specific style 7 jean this is? I must own a pair! I love this outfit so much! You are so gorgeous! And I know the FL weather today has been so scary! Gorgeous face, outfit and photos! Love that your paired the orange blouse with those boot cut jeans! So sassy and playful! Lets follow each other, and keep in touch. You are always in amazing outfits! Love it! Wow! 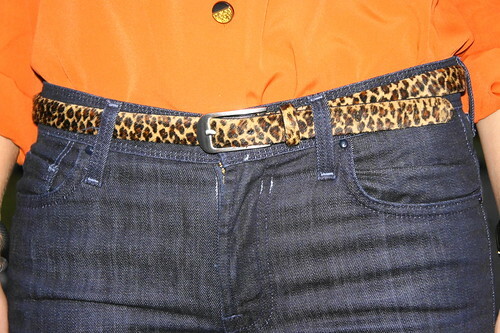 Absolutely gorgeous look, love the orange with the leopard print belt and those jeans look like they were made for you! Perfect accessories, as usual too. Lovely! those jeans make your legs look a mile long! and i love the orange with the leopard--your blog is fantastic! stunning outfit <3 love the way you paired the orange w/ a leopard belt!! You have such a great tush!! Those jeans are amazing. I literally JUST did a post on wide leg jeans today and hadn't even seen this post!! You look GREAT Here! Love this whole look! Oh my...I JUST realized that I used to follow you when I first starting blogging...and then somehow...not sure how...must have unclicked on follow or something...it has been AGES since I have visited your blog (found you again through November Grey)So glad to have found you again but I am so sad to have missed all these AMAZING outfits my dear....LOVE the orange contrasted w the darkest of denims. You look fabulous in those jeans. I am back, clicking follow and hoping nothing funky happens again! you are perfect. that bright colour is really great on you.